The common household wall wart is now under stricter regulation from the US Government. We can all testify to the waste heat produced by many cheap wall warts. Simply pick one at random in your house, and hold it; it will almost certainly be warm. This regulation hopes to save $300 million in wasted electricity, and reap the benefits, ecologically, of burning that much less fuel. We don’t know what this means practically for the consumer. Will your AliExpress wall warts be turned away at the shore now? Will this increase the cost of the devices? Will it make them less safe? More safe? It’s always hard to see where new regulation will go. Also, could it help us get revenge on that knock-off laptop adapter we bought that go hot it melted a section of carpet? However, it does look like most warts will go from a mandated 50-ish percent efficiency to 85% and up. This is a pretty big change, and some hold-out manufacturers are going to have to switch gears to newer circuit designs if they want to keep up. We’re also interested to hear the thoughts of those of you outside of the US. Is the US finally catching up, or is this something new? After adding a few LED light strips above his desk, [Bogdan] was impressed with the results. They’re bright, look awesome, and exude a hacker aesthetic. Wanting to expand his LED strip installation, [Bogdan] decided to see if these inexpensive LED strips were actually less expensive in the long run than regular incandescent bulbs. The results were surprising, and we’ve got to give [Bogdan] a hand for his testing methodology. [Bogdan]’s test rig consists of a 15 cm piece of the LED strip left over from his previous installation. A Taos TSL2550 ambient light sensor is installed in a light-proof box along with the LED strip, and an AVR microcontroller writes the light level from the sensor and an ADC count (to get the current draw) of the rig every 6 hours. After 700 hours, [Bogdan]’s testing rig shows some surprising results. The light level has decreased about 12%, meaning the efficiency of his LED strip is decreasing. As for projecting when his LEDs will reach the end of their useful life, [Bogdan] predicts after 2200 hours (about 3 months), the LED strip will have dropped to 70% of their original brightness. Comparing his LED strip against traditional incandescent bulbs – including the price paid for the LED strip, the cost of powering both the bulb and the strip, the cost of the power supply, and the time involved in changing out a LED strip, [Bogdan] calculates it will take 2800 hours before cheap LEDs are a cost-effective replacement for bulbs. With a useful life 600 hours less than that, [Bogdan] figures replacing your workshop lighting with LED strips – inexpensive though they are – isn’t an efficient way to spend money. Of course with any study in the efficiency of new technology there are bound to be some conflating factors. We’re thinking [Bogdan] did a pretty good job at gauging the efficiency of LED strips here, but we would like to see some data from some more expensive and hopefully more efficient LED strips. Love it or hate it, there’s no denying that part of its accessibility comes at the expense of speed and efficiency. We honestly like the platform as well as all of the others out there, because we believe that everything has its proper place and purpose. 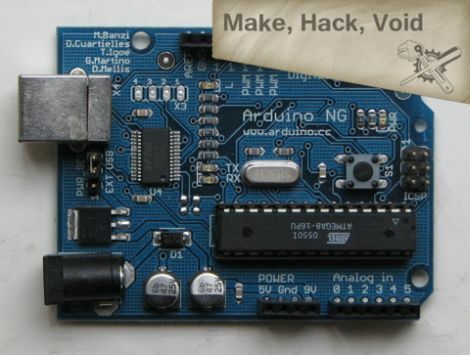 The crew over at Make, Hack, Void think that the Arduino dev boards are well and good, but that the core of the Arduino runtime could use some improvement. They have taken it upon themselves to dig deep into the code and make some of the improvements that many advanced Arduino users have been clamoring for. Their MHVLib is an efficiency oriented runtime library which works on all AVR microcontrollers, whether they be standalone uCs or Arduino-branded hardware. They have changed the way that the Arduino handles pin and port information, as well as how object and buffers are allocated in memory. Their code still relies on an Arduino-style bootloader, though they recommend Optiboot since it’s about a quarter of the size of the Arduino version. There’s a complete list of what has been implemented available on their site, and you can grab the code via their GIT repository if you want to give it a try yourself.